Fast Start conversation: In 2010 Chief Marketing Officer, created a CMO’s guide to the social media landscape. This guide is designed to help a CMO decide where to invest and leverage social website like Facebook, digg, redditt, and del.icio.us. 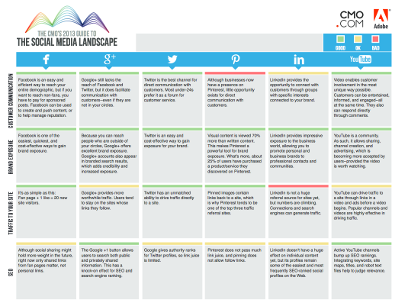 In 2011 CMO updated their guide and added sites. Time out. del.icio.us? digg? Your organization not familiar with either? In 2012, again, new sites arrived. In 2012 did your organization invest in Pinterest? Google+? In 2013 a CMO might wonder about the total amount of sites that take attention and divide resources. Was there a reduction in sites to focus? Read what CMO.com says about 2013. Are these Social Landscape guides helpful? What next to join or fall off? Now, who is prepared for 2014?